Dentures are an easy way to quickly and economically replace multiple missing teeth. 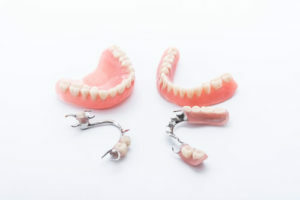 Modern dentures are more comfortable and natural looking than those of your grandparents. Dentures are often made using either a metal or plastic framework. Each have their own advantages and the best outcome will depend on the health of the remaining teeth. A well-made denture can be a fantastic solution, but can take some getting used too. If you have a denture but still find yourself struggling to keep it in place or if it is negatively affecting your life, there are now other options. Today dentures are often fixed or held in place with 2 or more dental implants. This gives the advantage of being able to remove the denture for cleaning, but with the stability and security of knowing it’s held in place whilst eating, speaking and laughing. If you don’t like the idea of taking your teeth in and out of your mouth, dental implants can again be used to hold permanent replacement teeth in place. Whether its replacing just the missing teeth on one side of your jaw or all of your teeth, its often possible to have permanent teeth again. Deciding which options are available and which is the best option for you will often require a 3D x-ray scan of your jaw. These scans are unfortunately not covered by Medicare and generally cost about $150 at your local radiology clinic. It is important to realise that dental implants are not a suitable solution for all people, but they are not the only solution. If you would like to know more information on what your options are, please contact us for an appointment.